Software development is a mature profession. The first programmer is generally considered to be Lady Ada Augusta Lovelace (1815-1852), and much of the theoretical underpinnings of today’s computer systems evolved in the 1940s and 1950s. Yet the pace of change continues to accelerate. In today’s software development community, there’s plenty of room for innovation. Big companies, small companies, standards bodies, open-source projects all continue to advance the art, continuously setting a new direction and agenda for enterprise developers. 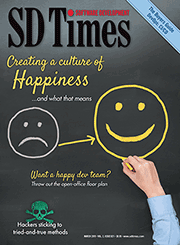 The SD Times 100, presented here for the first time, is our attempt to identify those tool and platform vendors that consistently offer an innovative approach to enterprise software development, as well as those that are in a strong leadership role in their competitive space. Those two attributes are not the same, of course, as innovation doesn’t necessarily lead to market success, and often the biggest companies are the most firmly entrenched in the status quo. Yet both leaders and innovators have something in common: Everyone is watching to see what they’ll do next. Enterprise development managers look to them to set expectations for the next wave of computing, competitors regard them nervously, investors open their checkbooks, and other vendors wish to partner with them-or acquire them, as we saw often in 2002. The era of Lady Lovelace may be over. But the legacy of computing innovation that she inspired is still very much with us.